Ms. Sortino’s kindergarten art classes created Wall-E Worlds out of GEOMETRIC SHAPES. Students learned how geometric shapes are shapes with names (i.e. squares, rectangles, circles). 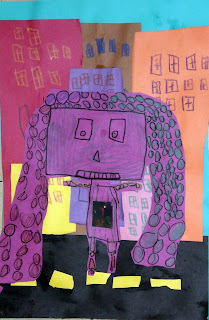 Then, students created their own robots out of geometric shapes and colored them in using construction paper crayons. Finally, students created a city out of geometric shapes and construction paper for their robots to live in. How many geometric shapes can you find in each picture?